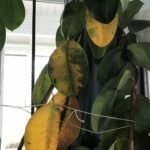 What are recommendations for winter rubber tree house plants in middle Georgia? Need recommended light, lowest temperature, watering, and general maintenance for winters that can have temps as low as 15 to 40 degrees. They can only tolerate temps down to 30F. It would not survive outdoors where you live over winter. Indoors, it prefers low light to mid light. Water the plant when the soil feels dry to the touch on top of the soil. For the most part, houseplants need little care beyond watering in the winter as they go dormant and their growth slows down. Fertilizing is not recommended. Log in or sign up to help answer this question. Did you find this helpful? Share it with your friends! You must be logged into your account to answer a question. If you don't have an account sign up for an account now. Do you know a lot about gardening?